It might be March and officially spring, both meteorologically and astronomically, but there’s still a noticeable chill in the air. It’s the time of year when I want to move on to eating lighter foods, greener foods, yet still need to warm my bones. To my delightful surprise, this week’s recipe for Cook the Book Fridays matched my cravings perfectly. 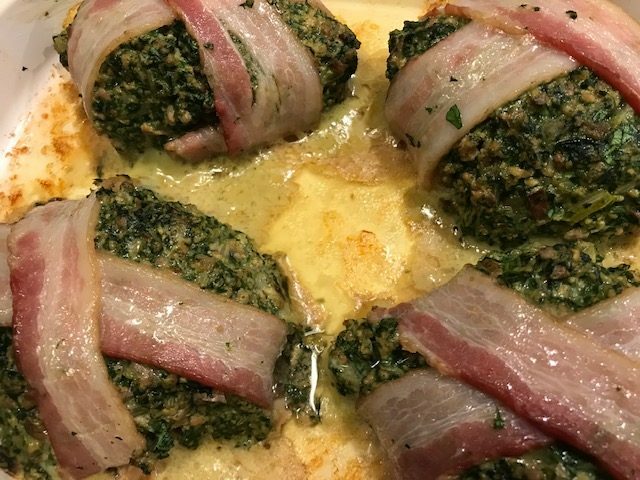 Pork and chard sausage, known as caillettes, are sausage patties chock full of greens. 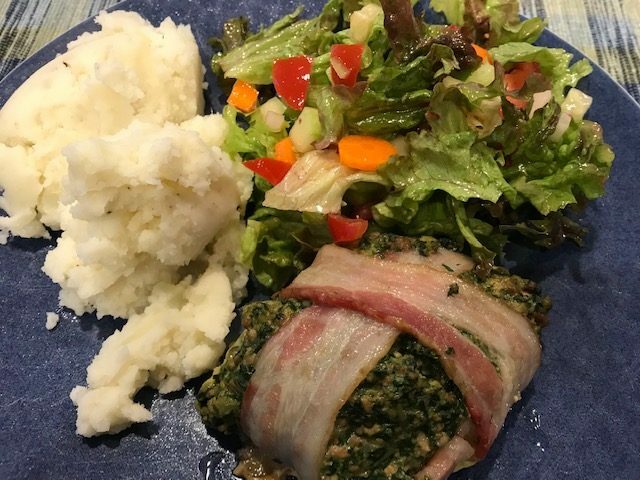 Swiss chard and parsley provide the green, which help to cut the richness of ground pork and chicken liver as well as the bacon wrapping. 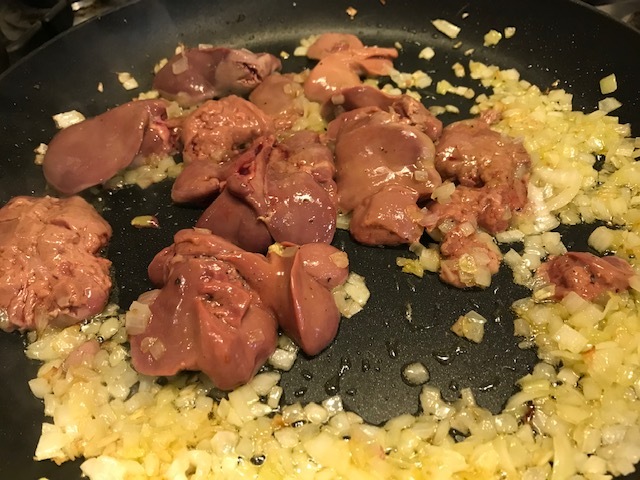 The recipe starts out the same way you make chopped chicken liver by sautéing onions until they are soft then adding chicken livers to cook through. The recipe calls for only a quarter-pound of chicken livers, much less than the standard package for sale. This provided an excuse cook the entire package of chicken livers with additional onion, taking out what was needed for the sausage, then combining the remainder with a hard-boiled egg for a chopped liver snack. Next, ground pork is cooked with garlic and thyme. 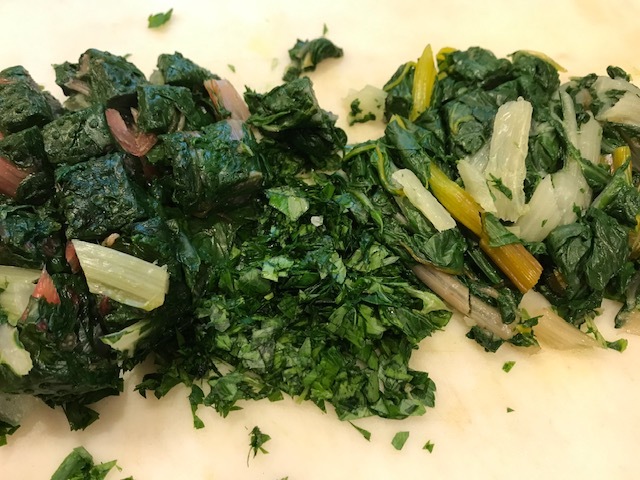 In parallel, a bunch of Swiss chard is boiled until tender. All these ingredients go into the food processor with fresh parsley, lemon juice and an egg to bind the concoction. The sausage meat is shaped into four oval patties to resemble quail. And then each patty is wrapped in a crisscross of bacon strips (David’s much more appealing alternative to caul fat). I found it much easier to place the bacon in my palm, top it with the sausage patty and then wrap with the ends of the bacon strips rather than doing it in the baking dish where the patty seemed to fall apart when I tried to tuck the ends under. The sausage is then baked. The instructions said “until the meat is cooked through”. I assumed that meant until the bacon looks cooked as all the ingredients except the egg were already cooked before even shaping them into caillettes. That said, the bacon never fully “crisped” but it no longer looked raw after 35 minutes. As suggested, I served caillettes with mashed potatoes and green salad which made a nice presentation. The caillettes were delicious, with a wide array of flavors to enjoy. On the other hand, this recipe used a lot of dishes, way more than warranted. While I enjoyed the end result, but I don’t know that I’d make this recipe again. In My Paris Kitchen, David Lebovitz mentions that the first time he had caillettes, he thought they were baby quail as caille means quail in French. I thought that definition was correct, but that the sausage got their name from their oval shape which loosely resembles a quail. I looked it up and was amused to learn that caillette actually means abomasum, which is the fourth stomach of a ruminant (like a cow or sheep). I suppose with all those greens, the diner could metaphorically be eating from the pasture? 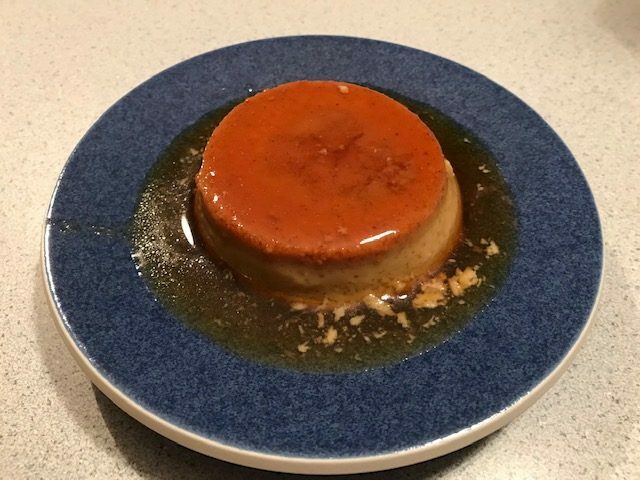 A couple weeks back, I also made the Spiced Speculoos Flan also from David Lebovitz’s My Paris Kitchen. I was not particularly excited to make this seemingly creamy indulgent dessert. It was easy enough so I gave it a try, reducing the recipe to use just a single egg. This one took me by surprise! It turned out to be rather light both in texture and sweetness. The speculoos spread I had was “chunky” so with the reduced quantity I made, I had trouble incorporating it into the custard, even in the blender. However, between the speculoos in the custard and the caramel each bite had just enough sugar along with a little warm spice. My ramekins were a little smaller than the ones called for, making 3 smaller ones rather than two slightly bigger ones (for one-third the recipe). I reduced the cooking time but ended up overcooking them a tad. They still tasted good. I would make these again. The formula also seems like something to play around with for other variations. If you want to try either of these recipes, you’ll find them in David Lebovitz’s My Paris Kitchen. You can also find out other bloggers’ impressions about the pork and chard sausage or the flans on Cook the Book Fridays.